Cuz it's only 5 Watts, so it's kinda mouse like in size, but it's loud and dangerous. Here's the test fit for the baffle. Yes, it's cut for a 12" speaker, in this case a 12" Celestion G12 M. This is of course another Danger Mouse reference: it's a Greenback. 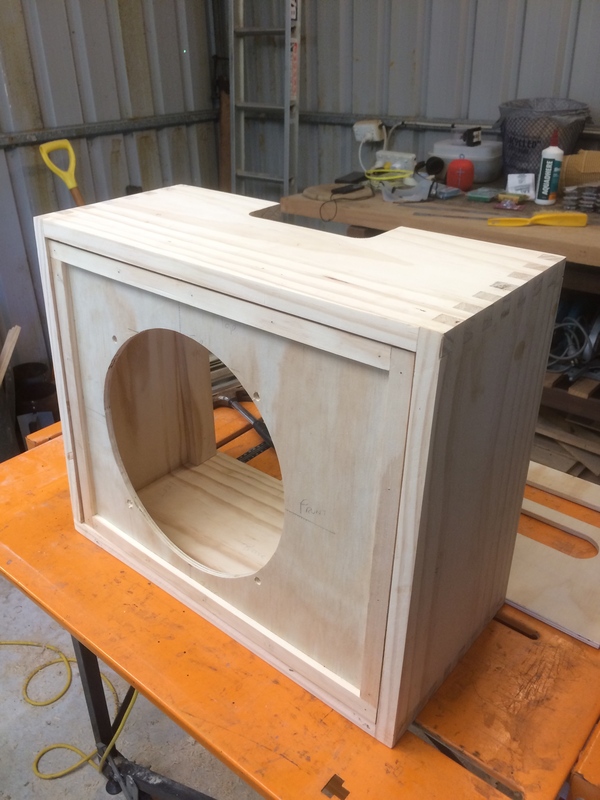 I've made the cab in a loosely tweed way as far as construction and dimensions are concerned, but I'm fitting this baffle sort of like a black face, or maybe a Supro. Anyway, it's going on the front instead of being mounted inside from the back. Also, I'm giving the Fender style screws for the speaker a miss this time. Instead I'm using 1/4" t-nuts that go on the front of the baffle, and garden variety 1/4" bolts. 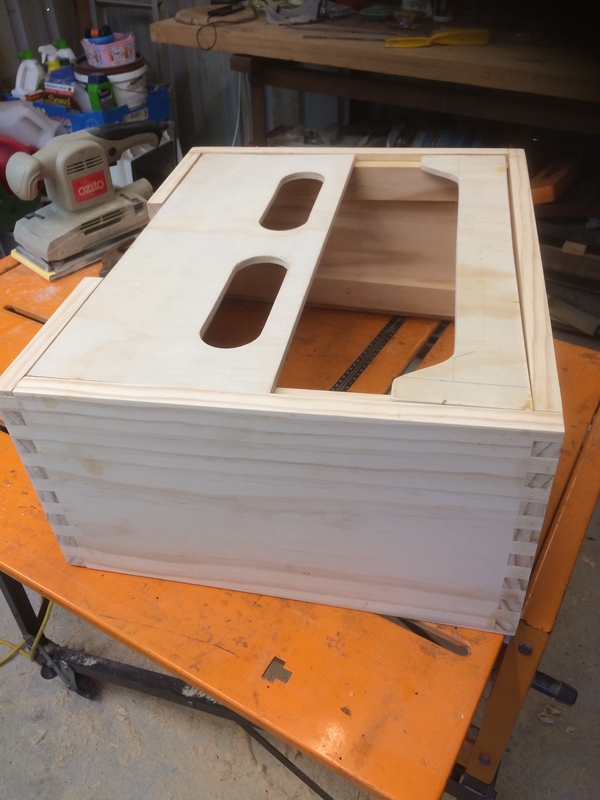 This entire project is about making the thing easy to use and service, and cheap to make. In fact, I've built it mostly from left over or scrap timber from previous projects. Here's the test fit of the back panels. 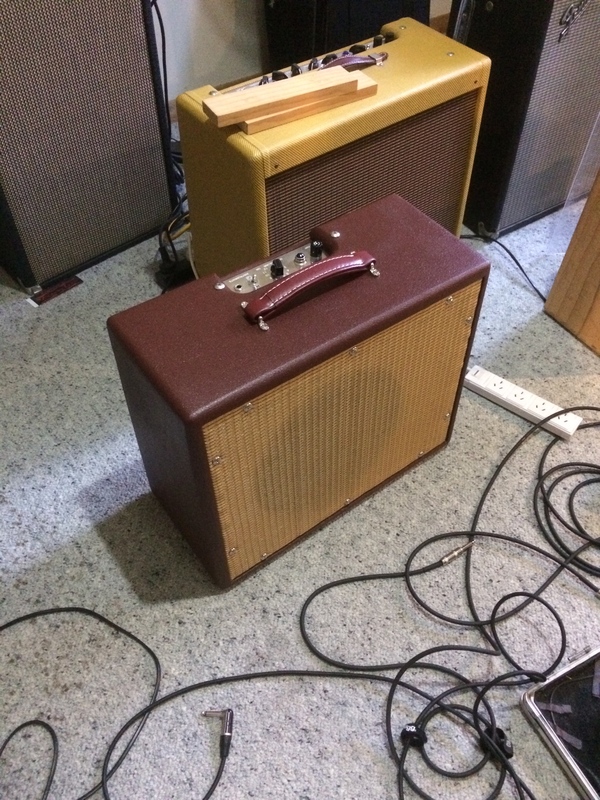 As you can see, the panels are copied from a Fender 5E3 Deluxe. The cabinet's outside dimensions are the same as a 5E3. I thought that was a good place to start for a small combo with a 12" speaker. Recorded at point blank range with an i5, then compressed and crappified through Youtube, but you get the picture...and the sound, such as it is. Guitar's a Korean Gretsch 5125. Just had a play of the D-Mouse in tandem with my Deluxe and tweed Super. Can now confidently report that the Danger Mouse is louder than the Deluxe. Speakers: they can make an amazing, obvious difference. Beautiful work, Splatt! 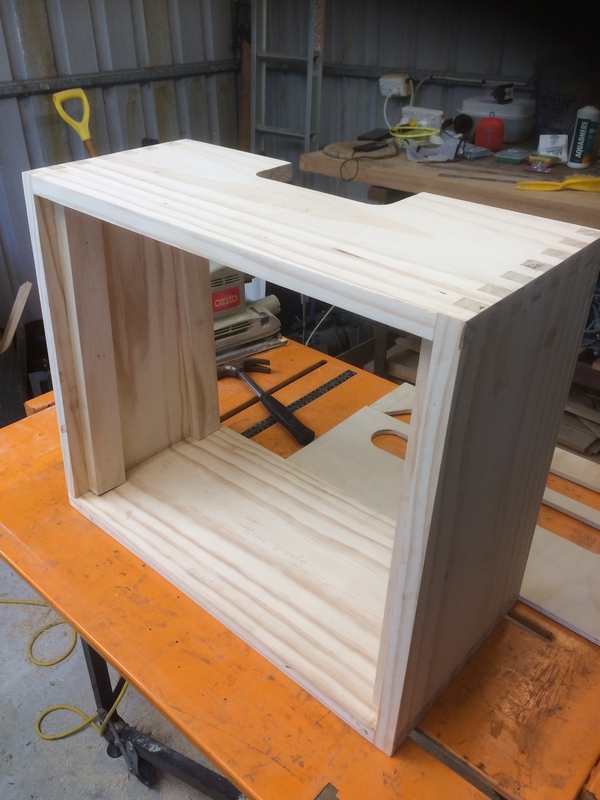 Great job on the box joints. How come you didn't go with a floating baffle? I honestly didn't think about it as a floating baffle or not decision. I was mainly concerned with making the cab as simple as possible, while making sure baffle was securely fixed to the cab. For simplicity, that meant mounting it from the front like a blackface. But I've never liked the way the screws on the blackface design are drilled through the battens and into the BACK of the baffle. It just seems weak, to me. So I decided to take a leaf out of the Supro book and screw the baffle from the front. I used DuraTex tint base. I was aiming for a kind of brick red. Got slightly-reddish brown. Doh! Going to gig it tonight with it’s blackface Champ mate. I love it! I think the color is fantastic. It's unique and stylish. The amp on top is a blackface Champ (in a head cab), through a Class 5 cab loaded with a Weber 10F150. 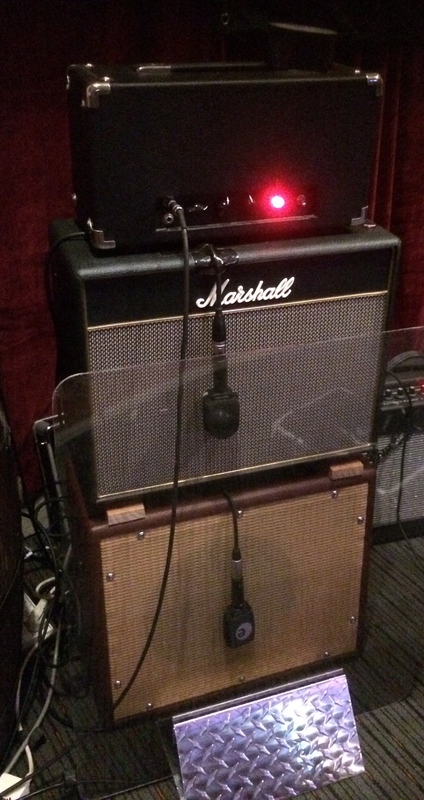 Very Fender sound.